12 Colorful Retro Valentines with Children! 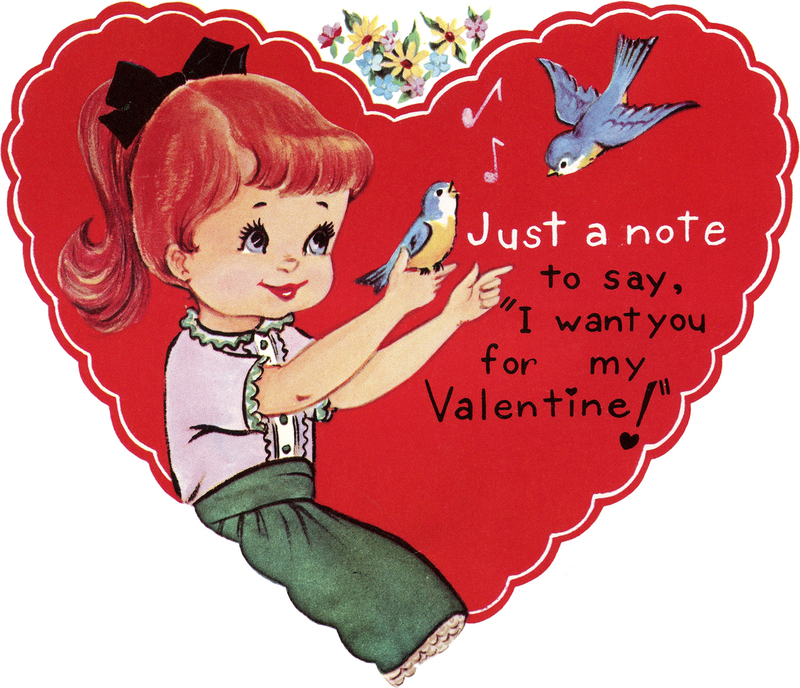 Today we have a charming collection of 12 Colorful Retro Valentines with Children Images. This curated assortment of retro Valentine card images is filled with colorful fun. I begin with two cards showing adorable children with their Valentines. There are also four sweet antique cards featuring cute little girls and six Valentine images featuring little boys. The vintage Valentine card pictures are perfect for Handmade Cards or Valentine Craft Projects. This is a fun Retro Valentine with Children image! 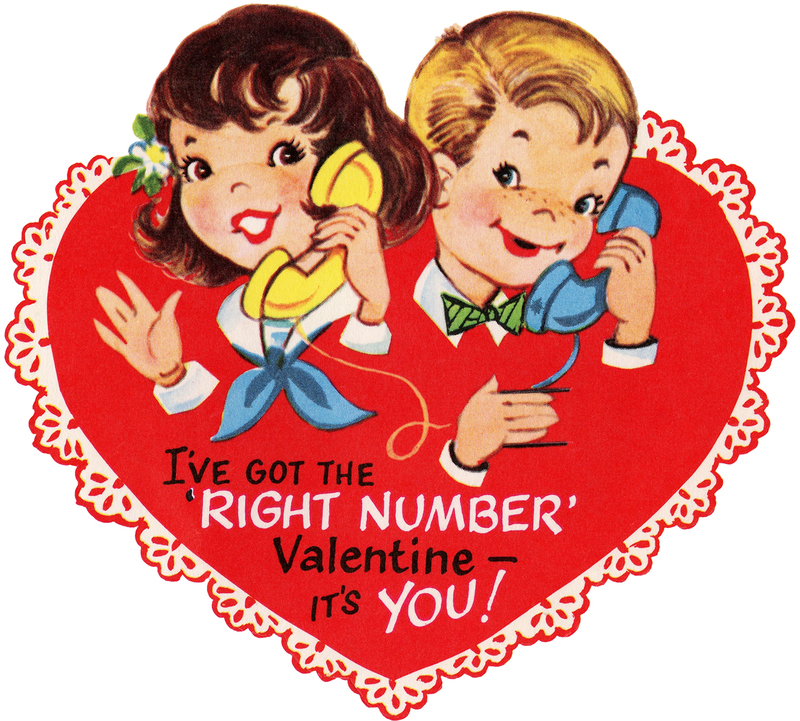 This adorable Valentine graphic shows 2 cute kids talking on the telephone! Above is a cute Retro Valentine Kids image of two sweet children. The little boy is handing the little girl a paper heart. 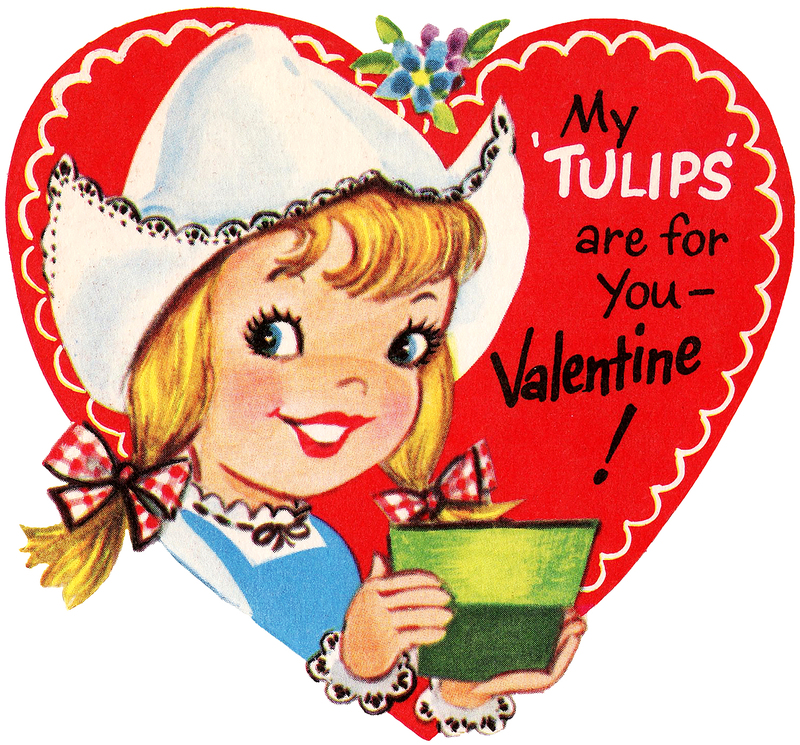 This one was scanned from an old Circa 1950’s Valentine Activity book. There is no copyright date in the book, and it does not appear to have ever been copyrighted. This is a darling Retro Valentine Heart image!! Shown above is a sweet vintage heart with an adorable little girl in the center of it. The little girl has beautiful red hair pulled back into a ponytail and she’s playing with some cute little bluebirds! Isn’t she a cutie pie? 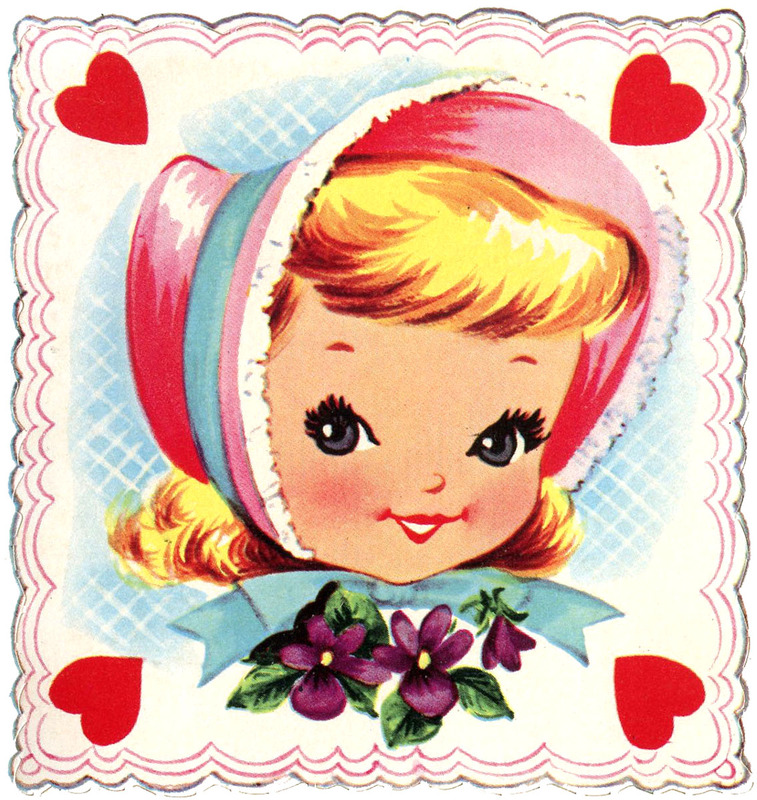 Here is a cute Retro Valentine Dutch Girl graphic showing a sweet little girl framed up inside of a big red heart! I love that it mentions tulips. So sweet! Such an adorable Retro Valentine graphic! This one shows a sweet little girl with some violets and hearts! It comes from a Valentine cut out book that was made around the 1950’s–early 1960’s. The book does not have a copyright date on it. 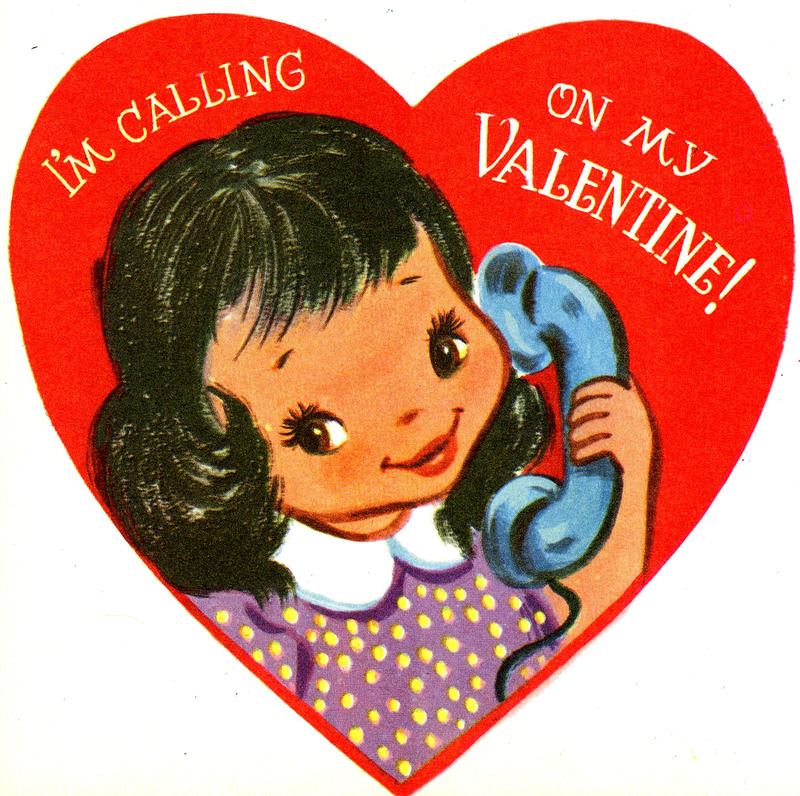 I just adore this darling retro Telephone Girl Valentine image! The sweet Valentine shows a cute little girl talking on the telephone. I love her big eyes! 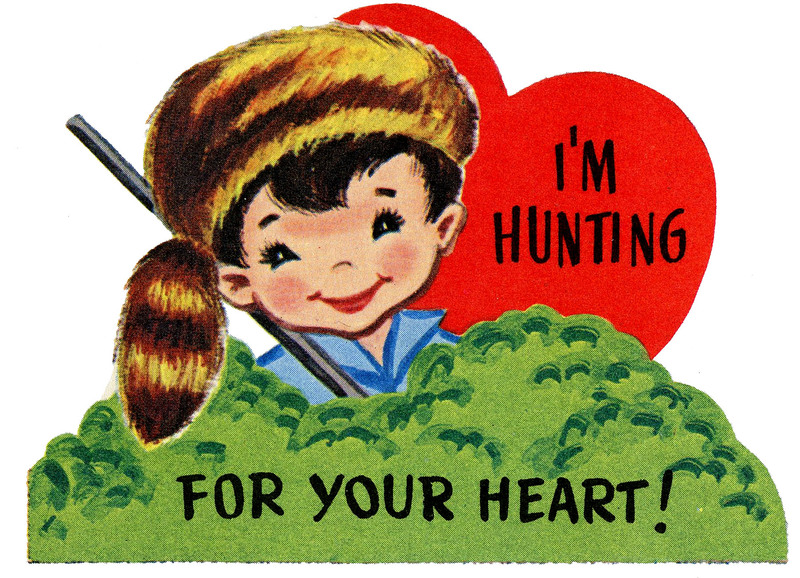 This one was scanned from the Circa 1940s or 1950’s Valentine Activity book. Above is a cutie patootie little retro Boy Valentine! The boy is wearing a red and white striped shirt and some blue dungarees. He is sitting on a big red heart! 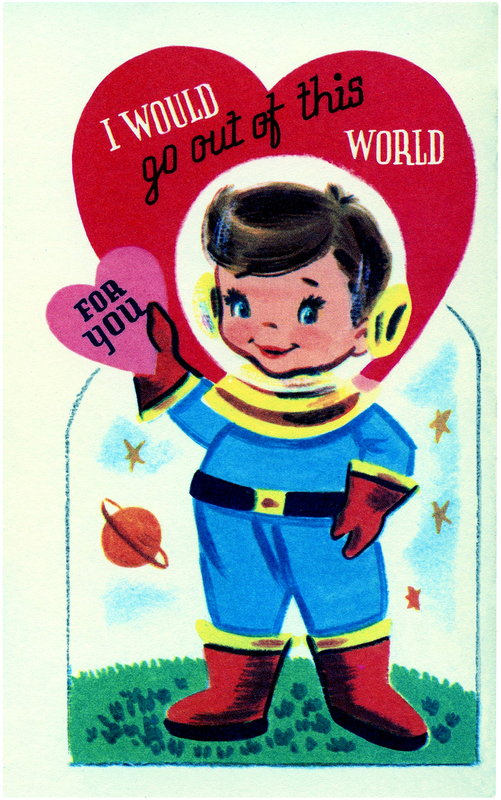 This sweet little Retro Valentine Boy image, from a 1950’s Cut Out book is too cute. The little boy is wearing a baseball cap. He has such a dear face! I love the scalloped edge on this too. 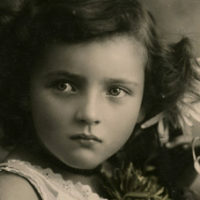 This one matches a Valentine card of a little girl in the above section. 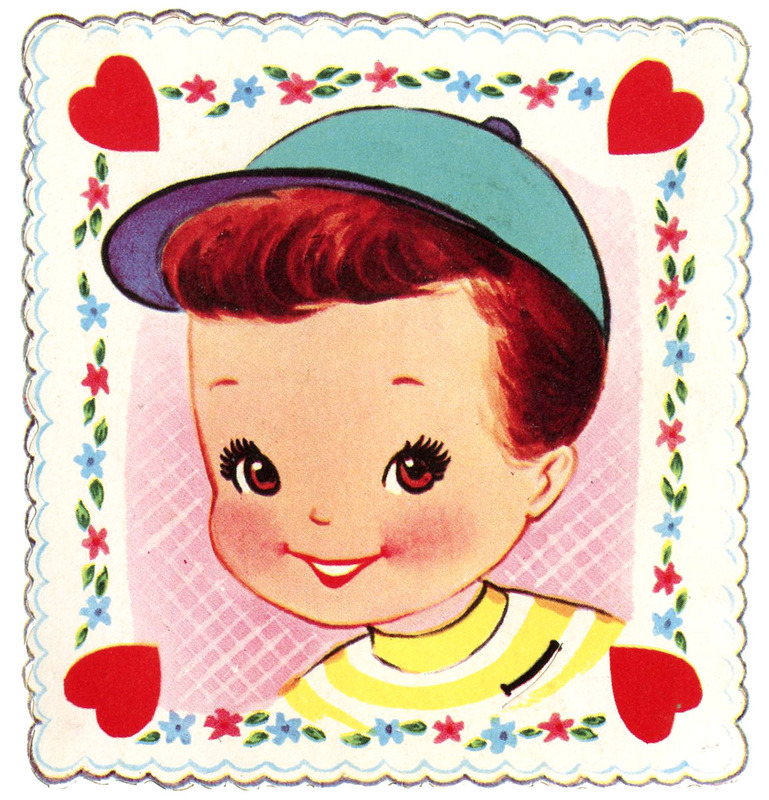 Shown here is a cute retro Valentine Boy card! This adorable Valentine shows a happy little boy in a racoon cap! It was scanned from the Circa 1940s or 1950’s Valentine Activity book also. It does not appear to have ever been copyrighted. 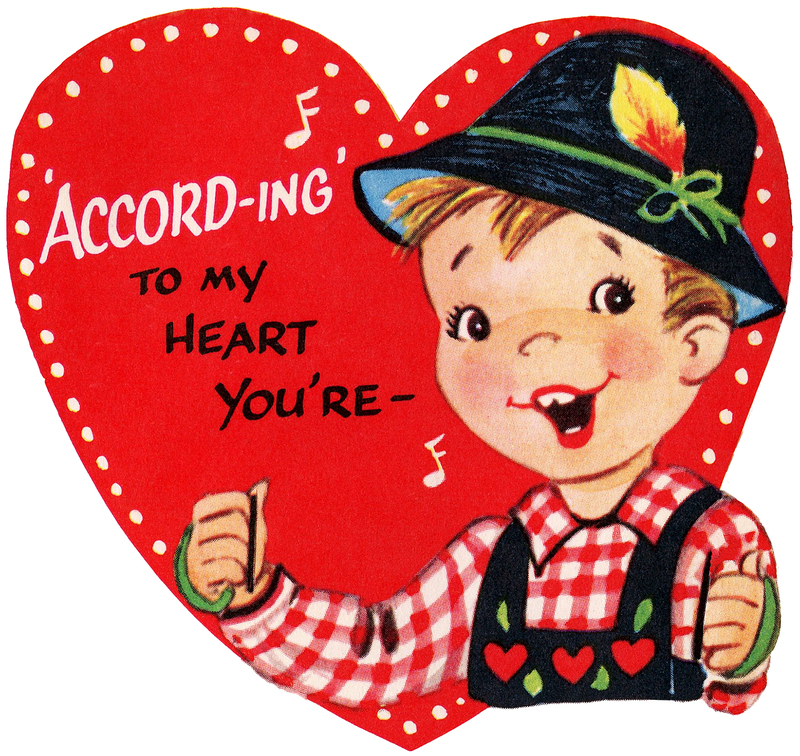 Above is an adorable Valentine card graphic with a cute child wearing lederhosen! He appears to be singing. So sweet! 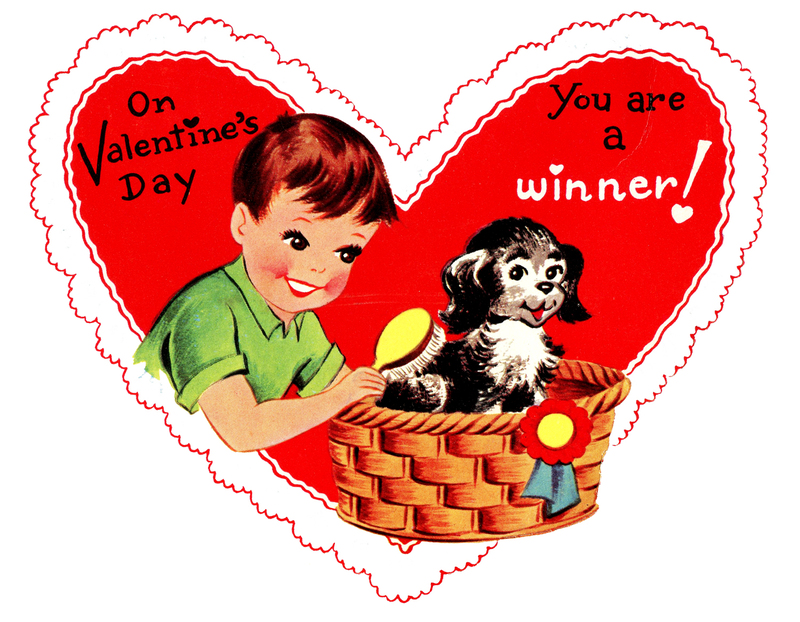 Our final image of our Retro Valentines with Children collection is a darling little boy and his precious pup! This is another one in the old Valentine book from my collection. The lace edged heart is so charming! 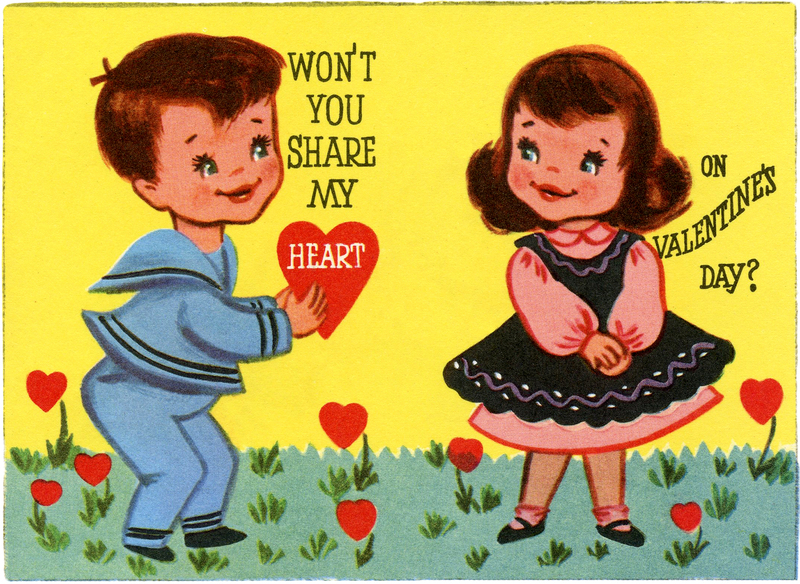 I hope you enjoyed this curated collection of 12 Colorful Retro Valentines with Children Images. You might also like our 40 Free Valentine’s Day Images HERE! « DIY Victorian Calendar – Mixed Media Tutorial! Oh, she is so so sweet! Thank you for this beautiful image…I love it…I was born in ’55, so I just adore anything like this. She is definitely a little cutie! So very cute! She belongs on stickers! How did you know I was looking for a cute retro image! This one is perfect! Thank you, so much! Oh, I love, love, love her!!!!! Thank you soooooooo very much!! Karen, thanks for the memories that came from the sweet little 50’s valentine you posted yesterday. To Maxine, who commented that the valentine made her feel old. I declare that I can remember getting that very valentine from a classmate. Sure wish I still had it. thanks for sharing your awesome graphics.. Thanks so much for these; just love them all, esp the little boy ones. Thank you so much for these cute Valentines featuring children. Hehe, I also am old enough to remember getting cards like these when I was in elementary school. Me too Sue 🙂 Glad you like them! I love the one of the little African-American girl! It has got to be quite rare for this time period! You are probably right Angela, glad you like it!